In 1946, member J.E. Willis develops the "Pendulum Astrolabe" for the Navy while working for the David White Company. The MAS displays at the Milwaukee Hobby Council Show which was a part of the Home Show at the Milwaukee Auditorium. 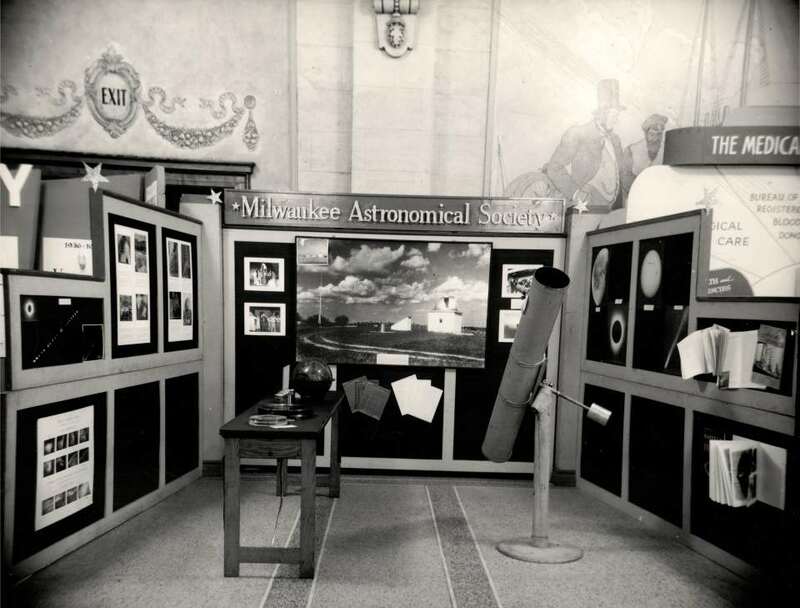 Photographs of the observatory, shots of the 1945 solar eclipse, a mirror grinding machine, and telescope were displayed. 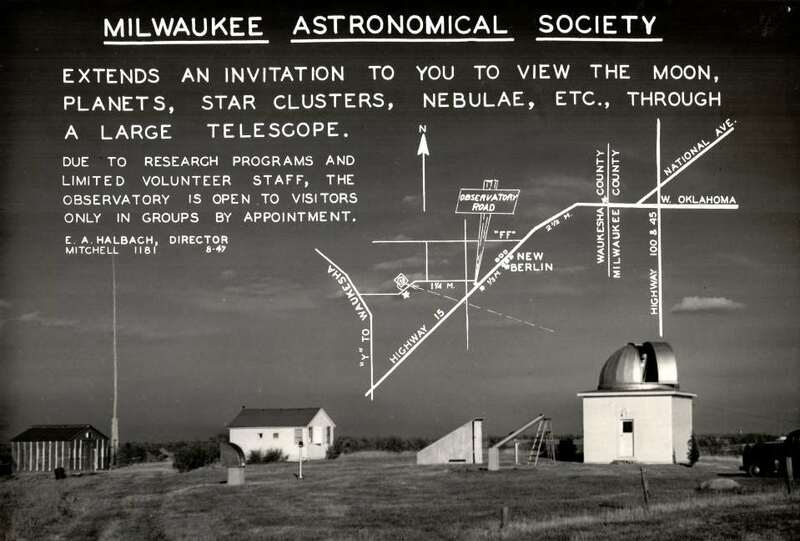 In 1947, the Astronomical League was formed and Ed Halbach is elected to be its first President. 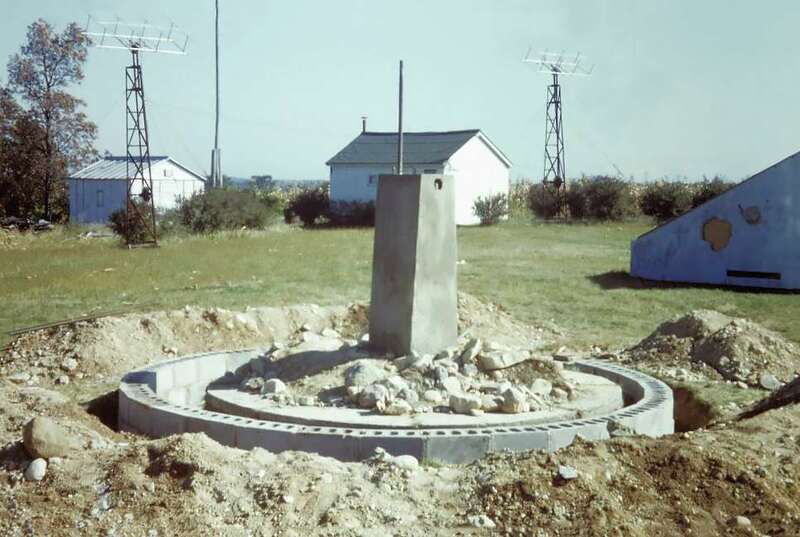 When Luverne Armfield left Milwaukee for a job in Ohio (eventually moving to North Dakota) he d donated the 13 inch reflector and his 10 inch reflector to the MAS. A structure is needed for the 10 inch. 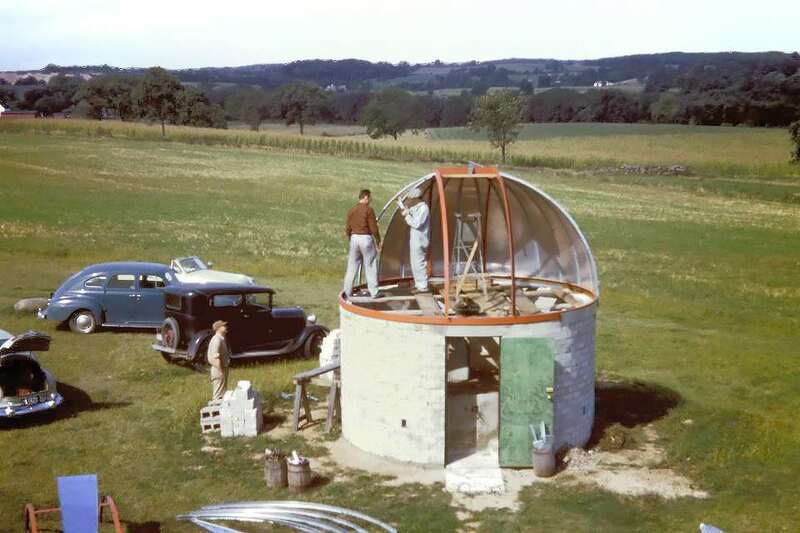 Bill Albrecht and Halbach construct a prime focus camera for the 13 in scope that became known as the Armfield Telescope. Also in 1947, the MAS started the summer open house program. The photo at the right shows a the directions overlaid onto the photo below and published in the Milwaukee Journal. 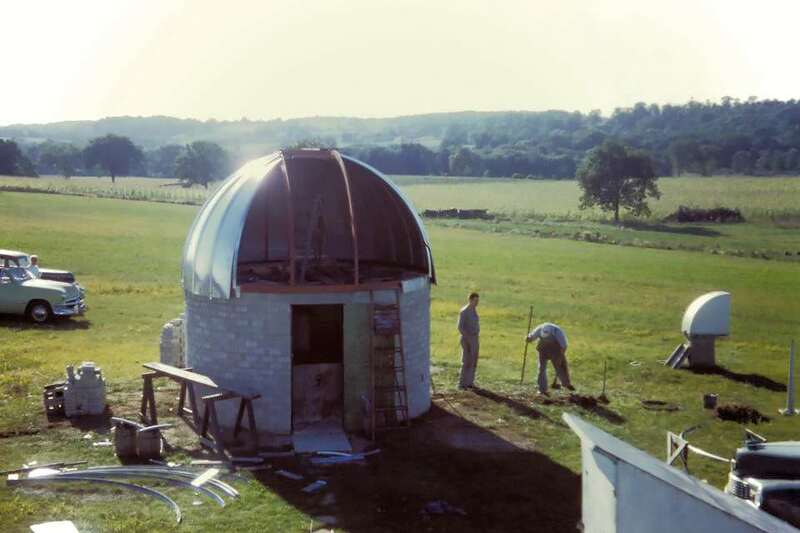 With the pending arrival of Buckstaff's 12.5 inch reflector and Armfield's 10 reflector already on hand, plans are drawn up for that telescope which include a major expansion of the observatory. A big reason for doing this was to protect the observatory from housing encroachment. 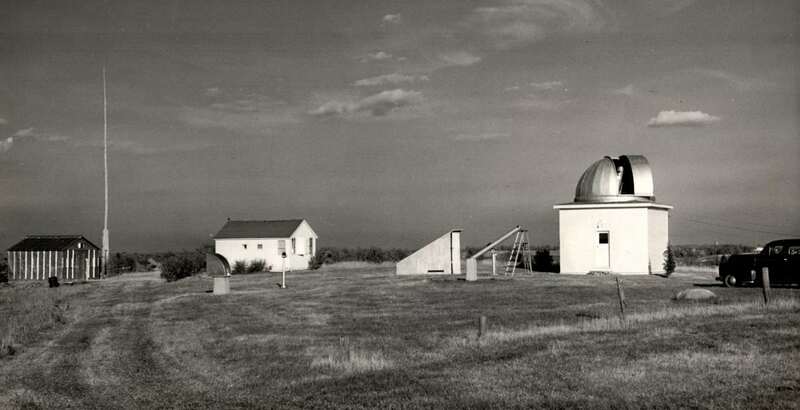 3.8 additional acres to be purchased (hopefully donated by the Phillips family) to the west and north, and a new observatory structure with 2 20-foot domes and 2 10-foot domes. The building will feature a large lecture hall, office/library, restrooms, darkroom, a bedroom, and lab on the first floor. In the basement there is a drive-in garage, workshop, storage, and a furnace. Plus there will be roof access. A large parking area would be needed to accommodate the growing membership and visitors. The grounds layout shown at the left show the original 1.1 acre and the buildings present at that time. You might note that the Tool Shed building was not placed on the property! It is certain that the Phillips farm was okay with this. 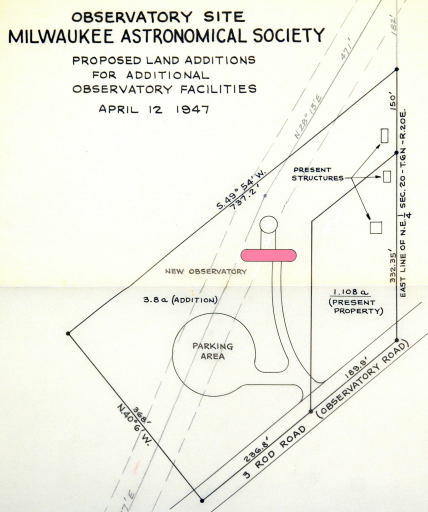 The area in pink is what is immediately planned and shown in the diagrams below. 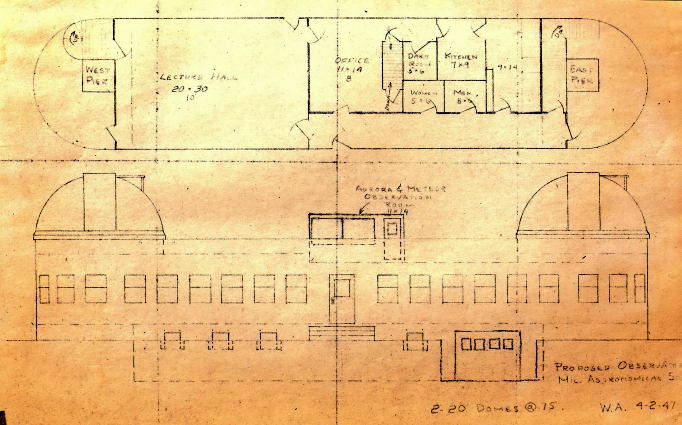 The area above it was for future planning which corresponded to the original plan from 1937 where there'd ultimately be an upside down "T" where the big circle is a very large dome with a very large instrument. The preliminary plan with just 2 domes, but they are 20 feet in diameter. The final proposed plans are shown below. Exterior. Now the plans call for the addition of two smaller (10 foot) domes for housing smaller instruments. Note the drive-in garage which is in the basement area. Basement level containing the garage, storage, work shop, and the furnace. Ground level contain the lecture hall, office and library, lab, restrooms, darkroom, and sleeping quarters. Roof. Access through a stair case. Note the dome slits are shown as the same type as the A-Dome. 1948: The annual dues were increased from $3.00 to $5.00. 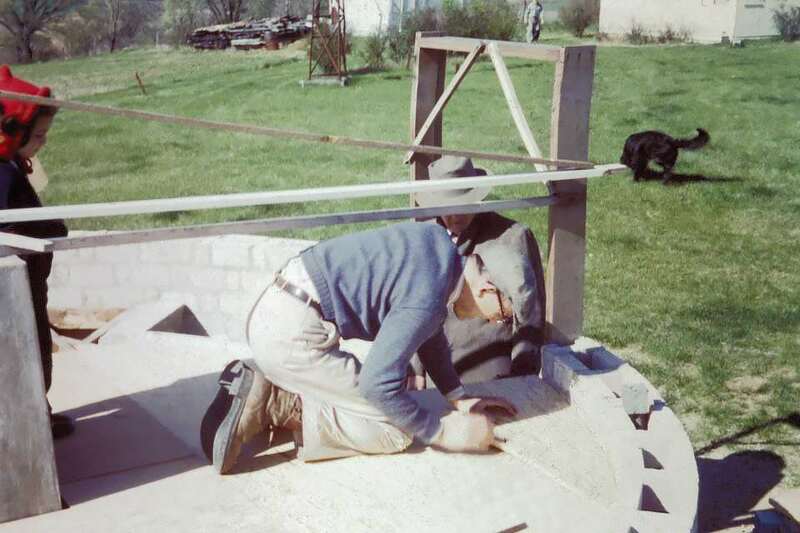 Halbach and Albrecht build a rotary lawnmower for the observatory using a war surplus gasoline generator for power. 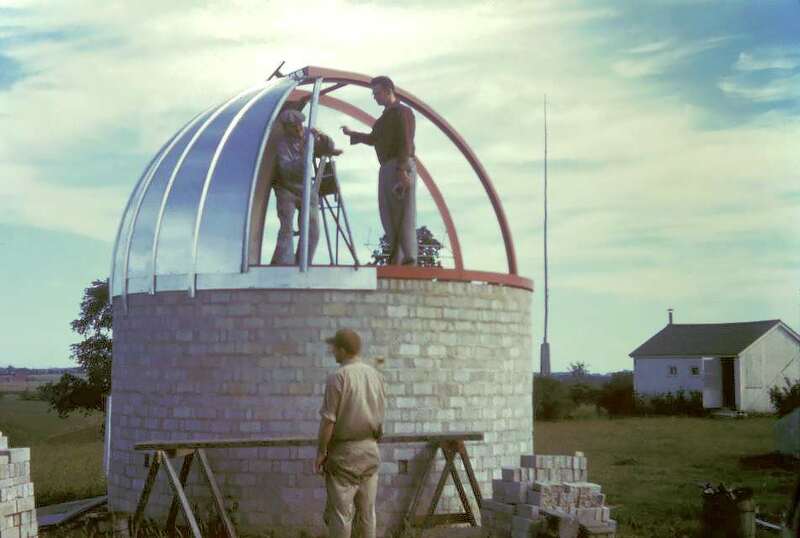 The MAS begins a yearly contribution to the Kusiusko Fund in an effort to rebuild the famous Cracow, Poland observatory. Halbach heads an eclipse expedition to Burma, sponsored by the National Geographic Society. The group obtains 35 seconds of 35mm movie footage of the eclipse. 1949: The Franklin Burr Award from the National Geographic Society goes to Halbach for his efforts in Burma. 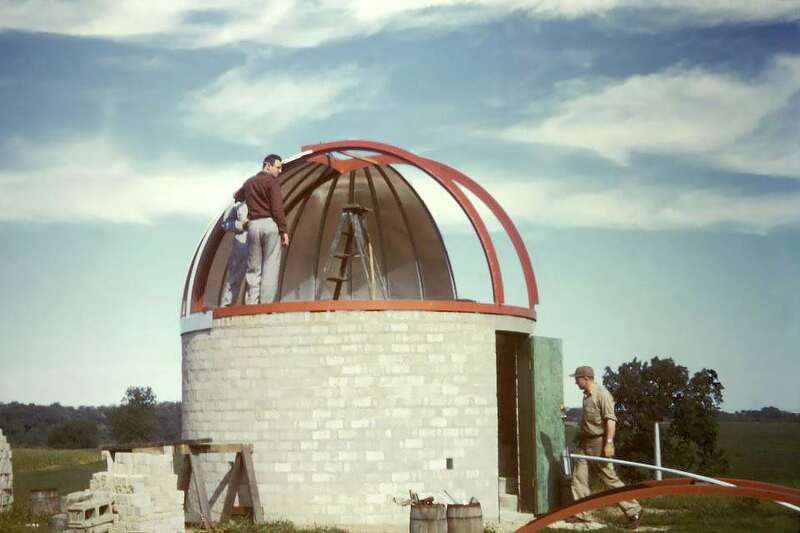 Allis Chalmers installs solar radio receivers at the observatory. The MAS is featured in an issue of the National Geographic about auroras. 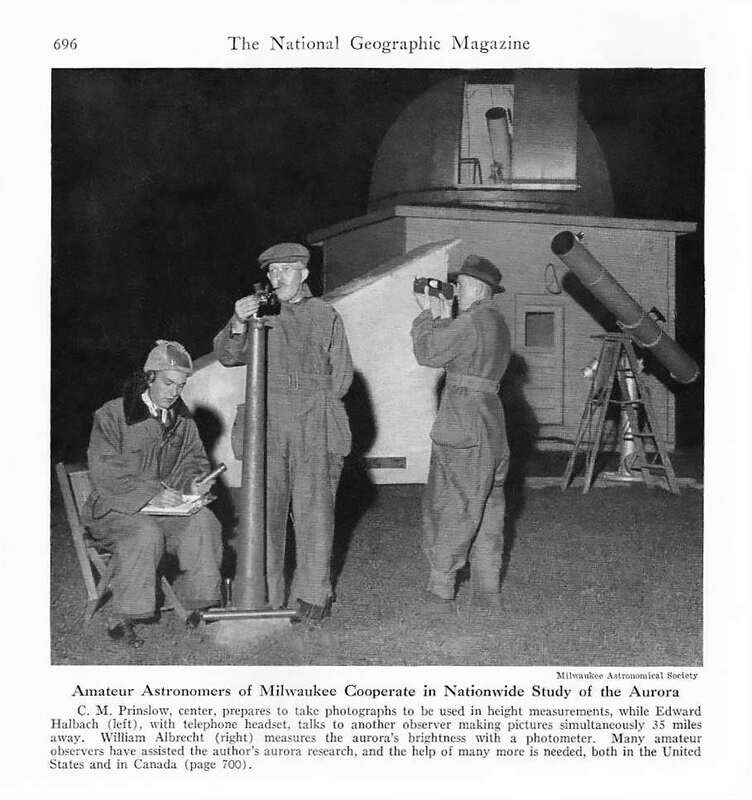 In the article there is a picture of Halbach, Albrecht, and Prinslow at the observatory doing observations of an aurora. 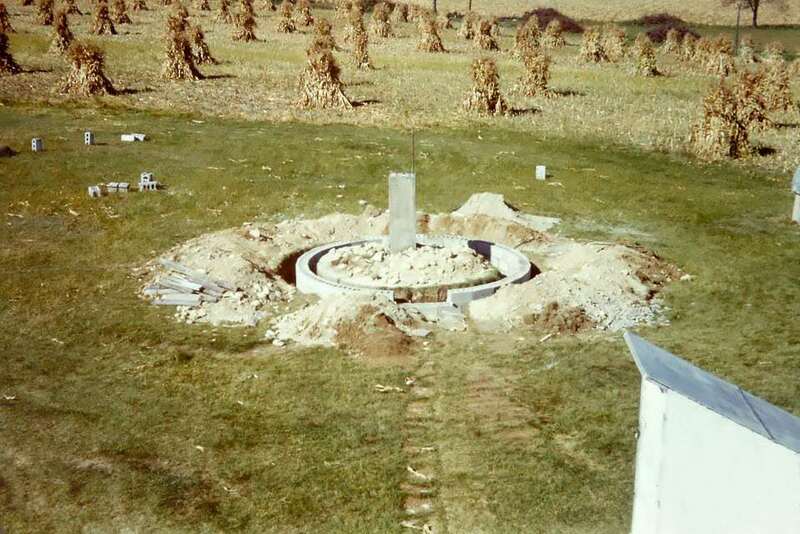 Instead, the expedient and logical solution was building a couple of standalone domed structures for the two telescopes, one of them where there was an existing concrete base and pedestal. 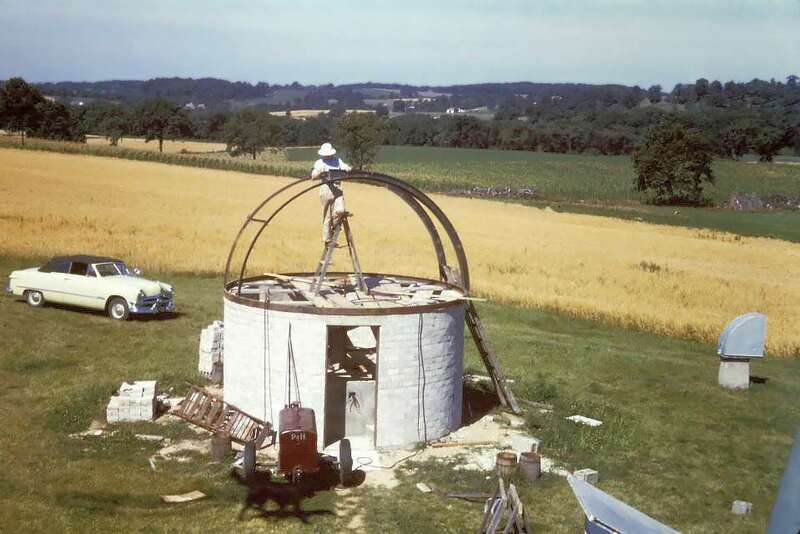 Instead of manufacturing the domes ourselves, they investigated buying a commercial product ($700 was quoted with another $700 for the walls) which proved to be too expensive and then the possibility of modifying a commercial farm silo dome. 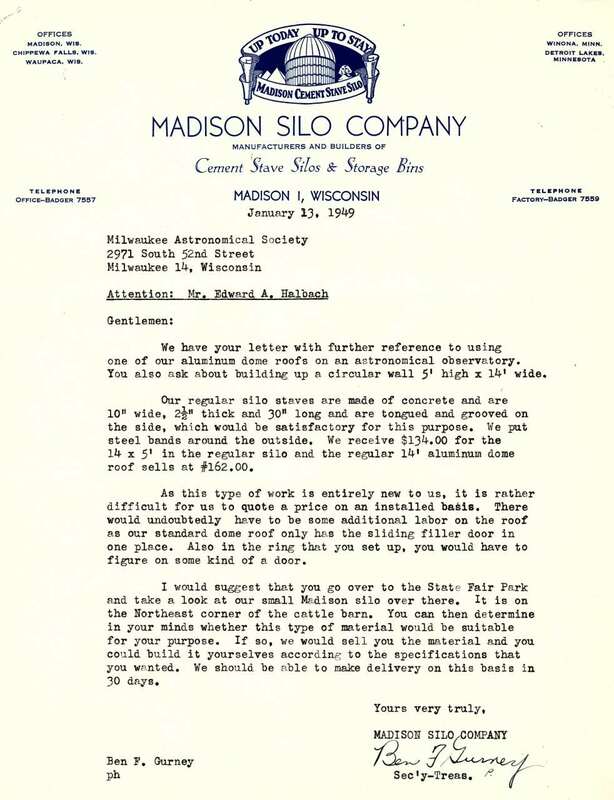 They received a quote of $162 for a 14-foot dome from the Madison Silo Company and $134 for the concrete silo sleeves for a 5-foot tall wall. But even better was the fact that the silo company was willing to help with some of the necessary modifications. Ed Halbach and a few other members made a trip to Winona, MN, where the manufacturing plant was located to advise on the modifications. It was calculated that $1000 was needed to build both structures so an appeal went out to the membership for donations. 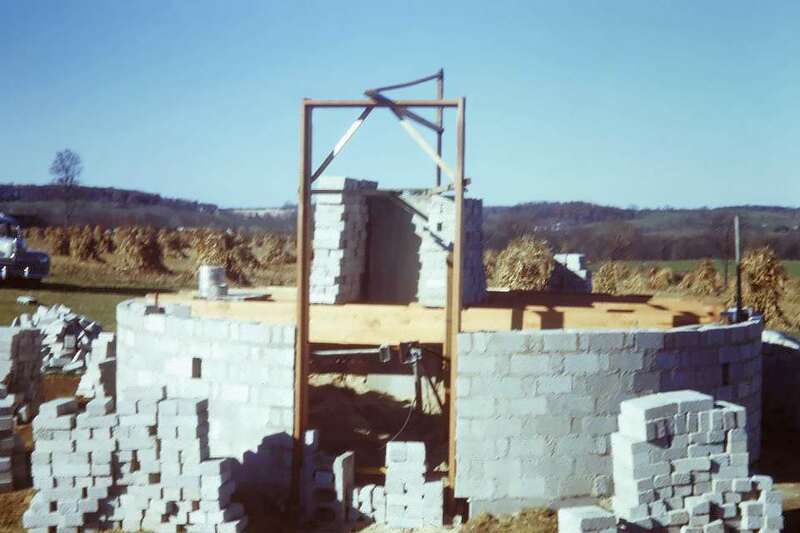 However, when only $560 was raised, only one observatory could be built. 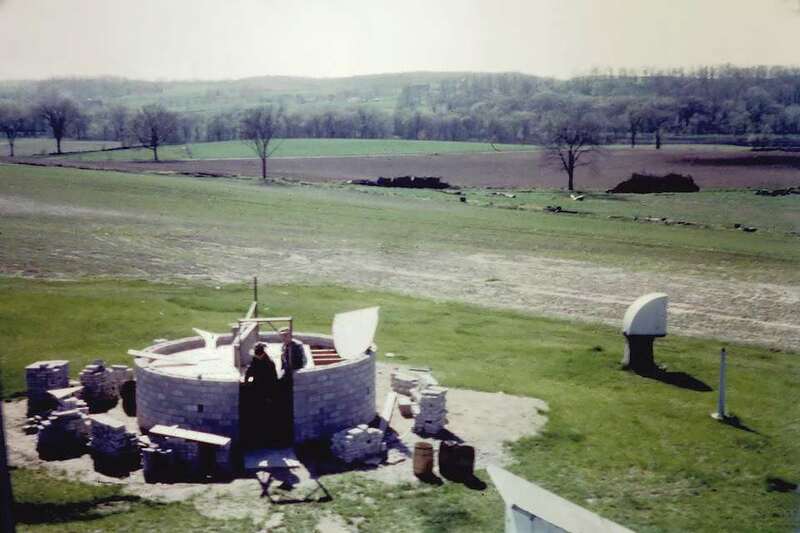 Thus began the construction of the Buckstaff Observatory (aka B Dome). 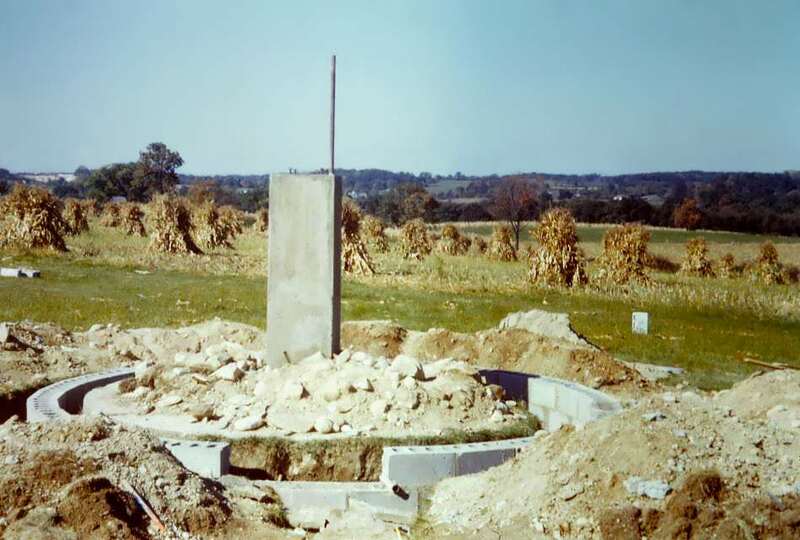 Ground breaking occurred in the late fall of 1949 and was largely complete (minus the dome slit) the summer of 1951. 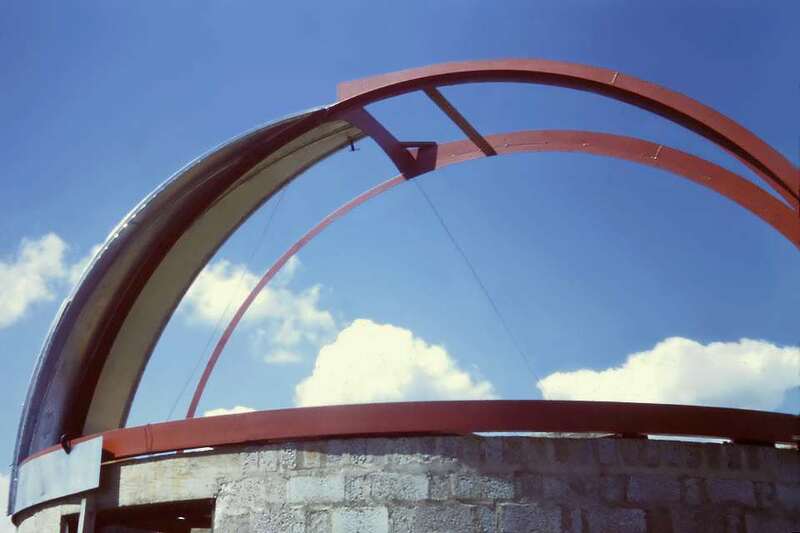 Though the placement of the observatory corresponded to the original plan, the building type did not. 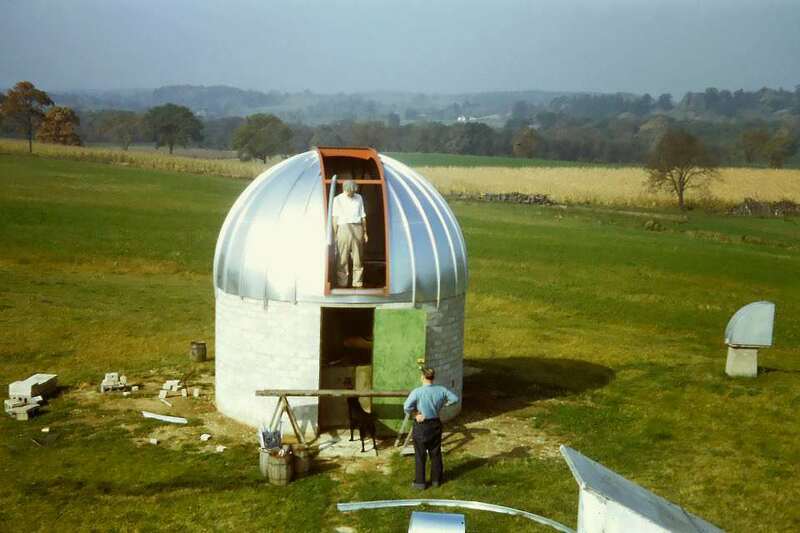 If it did, it would resemble the Armfield Observatory because the next step would be to join the two structures. 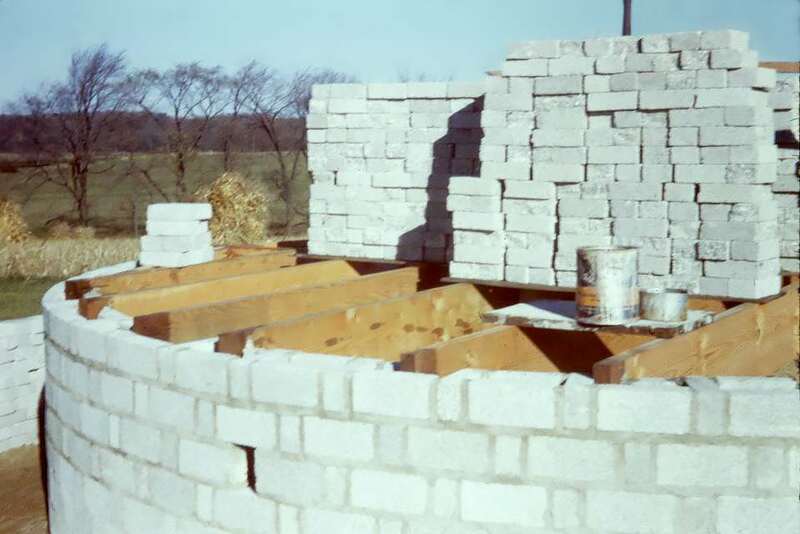 But a lower height circular building of cinder blocks was built instead. 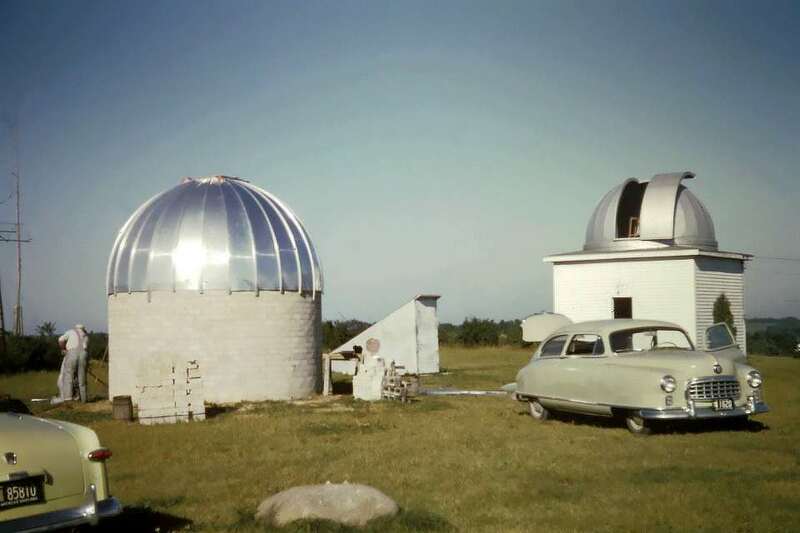 The story is that driving to the observatory one day, Ed Halbach, saw a local farmer starting to dissemble a corn crib. 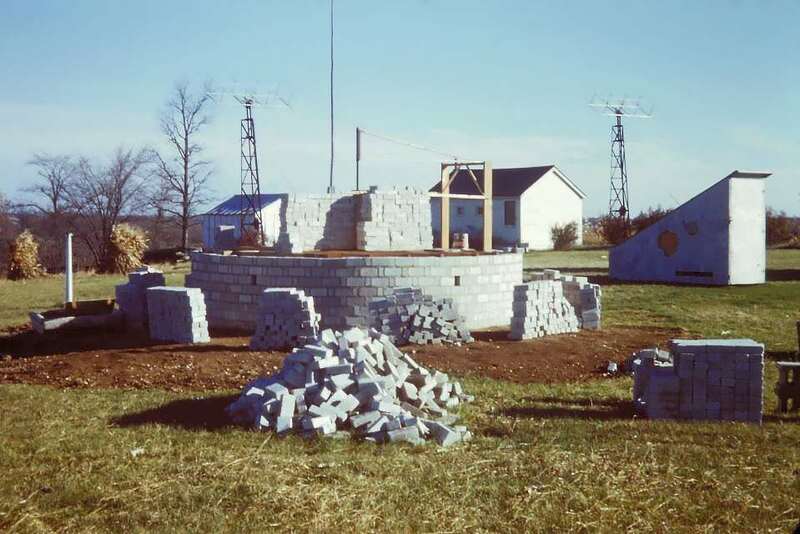 When he asked what the farmer would be doing with the cinder blocks, they negotiated a simple trade. The MAS could have the blocks if they would complete the disassembly. So additional money was saved on the blocks and only the top ring of blocks was purchased from the silo company. The dome itself differed from the Armfield Observatory in that the shutter panel would retract upward and would be motorized. A slight disadvantage of this design is that it requires a door at the bottom because otherwise there is not enough room for the slit to be moved backward to allow the zenith to be viewed. 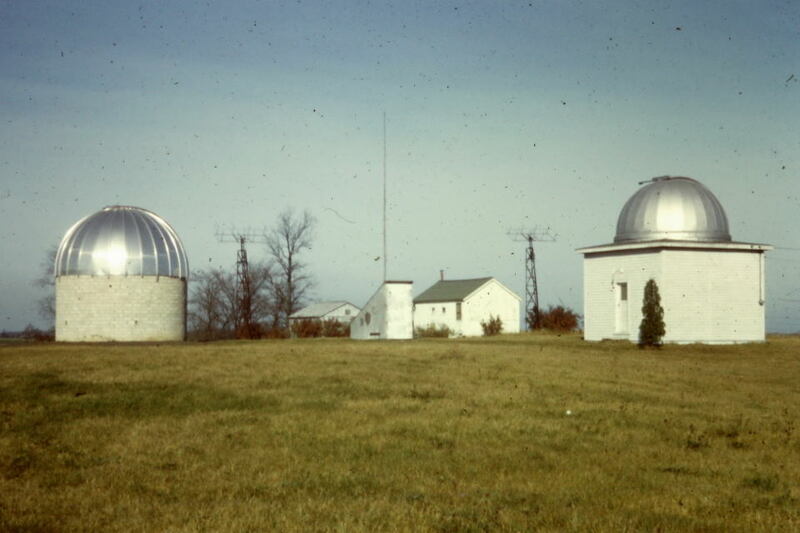 The photograph above shows our observatory as it looked by the end of 1951 with the new addition of the Buckstaff Observatory, although the slit is still unfinished. The picture above was taken in June of 1950. It is the only one of two known photograph taken inside the Monastery. Sitting (L to R) : Roy Dodd, Elizabeth Wight, Alfred Memmel. 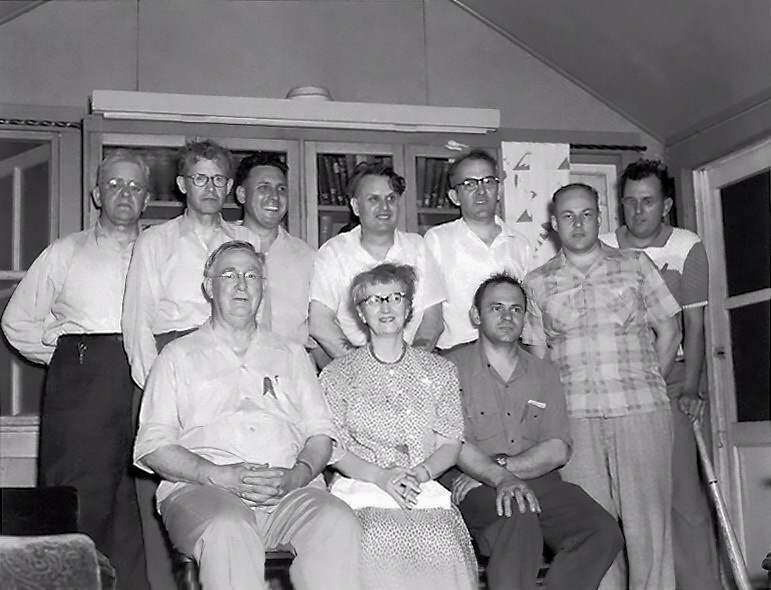 Standing (L to R): Herbert Cornell, Ralph Buckstaff, Roy Lee, Edwin Schoenke, Edward Halbach, Joseph Stevens, and William Albrecht (holding the baseball bat). It was an orderly group with Albrecht making sure of that.